Nowadays manufacturers and importers are required by retailers to supply shipping container labels affixed to the cartons shipped to their warehouses. While it is a reasonable requirement from a retailer’s perspective, it is a burden for a small manufacturer that does not possess an advanced IT system. Many manufacturers ship to several national retailers only, and it does not make sense to spend tens of thousands on a labeling system. 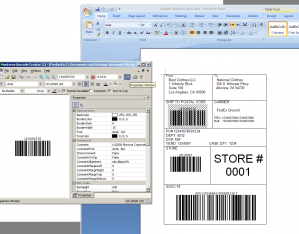 Fortunately with Monterey Barcode Creator, you can create labels easily from Microsoft Word. The image above shows a shipping label that meets the requirement of a national retailer. The whole label is 4″ X 6″. Most information in the label are quite obvious so we will not explain them here. The items that puzzle most are the three barcodes, required by the retailer for anyone doing business with. Those barcodes are actually not complicated as if they look at the first glance. All those barcodes are UCC/EAN-128 (also GS1-128) barcode. Their human readable texts all start with a number that is enclosed in parentheses. For example (420)54720. Here 54720 is the postal code, and 420 indicates that the data followed is a postal code. 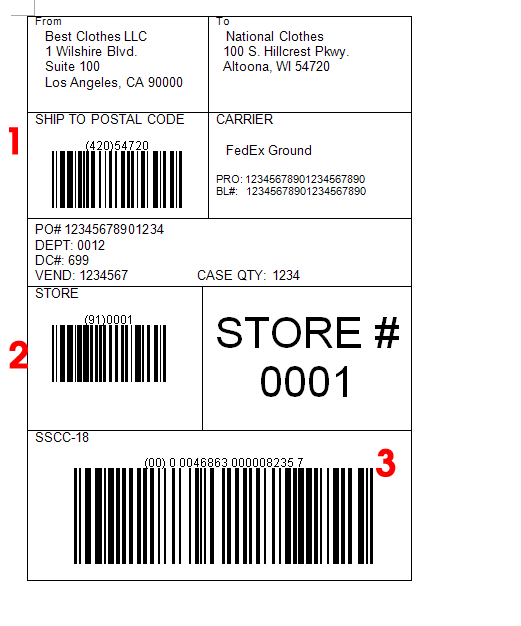 The top barcode encodes the postal code (or zip code, USPS code etc.) of the retailer warehouse. Open Monterey Barcode Creator, and select “UCC/EAN-128″ as the barcode type. Change property TextOnTop to true so that human readable text appears on the top of the barcode. Turn off the comment - we do not need it. Set BarHeight to 500 (as the barcode is 1/2″ tall), and NarrowBarWidth to 15 (15 mils, 0.015 inch). Enter text as exactly as the one in the image: (420) 54720. After that you should get the barcode shown on the screen. Now drag the barcode and drop it into Microsoft Word. Occasionally some people do not understand “drag and drop”. Here is the process: first move your mouse cursor on the barcode. Press you left mouse button. While holding this button, move the mouse cursor into Microsoft Word (you have to make sure that the Word window is visible at the beginning). Release the mouse button. The barcode enters Microsoft Word. Better thing is, next time when you create a barcode with different data encoded, you do not need to repeat the process. 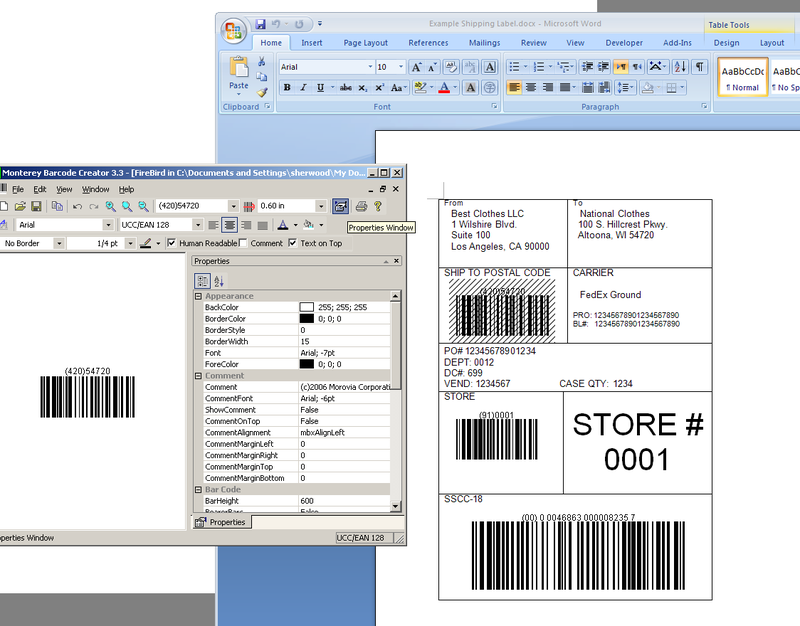 Double click on the barcode in Word, the Barcode Creator Window will appear. From there you can modify properties of the barcode. The changes automatically go back to Word. The barcode in the middle encodes store number - 0001 in our case. The process is similiar, except that you enter (91)0001 instead. Now comes the most critical barcode - SSCC18. This number and barcode are vital to the whole label, and you must proceed careful. If you are not familiar with this term, read this page first. This number is used throughout the supply chain. It is not just for the shipment between you and the retailer’ warehouse. After the box is received, it will be delivered to regional warehouses, and front stores. The number identifies the box in all the process. The number has three parts: (1) package type (the first digit). For cartons, it is 0. For pallets, it is 1. (2) Your GS1 number. (3) Serial number. The total length of (2) and (3) must be exact 16 digits. So if your GS1 number has 10 digits, you have 6 digits for the serial number. Lastly, the serial number must not repeat itself within one year period. It is your responsibility - recording it to a log is a good idea here. The last digit is the check digit, which is calculated based on the first 17 digits. You do not need to calculate manually, you can use the free utility here. This bar code is usually bigger than other barcodes because of its importance. In the example labe, we use 20 as NarrowBarWidth, and 1000 as BarHeight. That means the barcode will have X dimension at 20 mils and the height is 1 inch. If your shipping labels look similiar to the image above, you can simply download this file and modify by yourself. Note that you must have Monterey Barcode Creator 3.3 or above installed (trial is OK, but there is a watermark on the image) before you can change the barcodes.